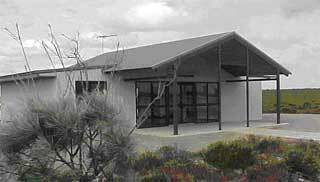 The Kalbarri Airport is a jointly owned by the Shires of Northampton and Greenough. The Airport was funded by both Shires, the State Government and significant contributions were also received from Arkona Holdings and Westralia Airports Corporation. The total cost of the construction is approximately $1.7 million. The Airport was officially opened on the 22nd September 2001 by the Hon. Michelle Roberts. The Kalbarri Airport is located on Fawcett-Broad Drive. The turnoff is 10km east of Kalbarri on the Kalbarri-Ajana Road, it is well sign posted and is visible from the Kalbarri-Ajana Road. Click here for a detailed diagram of the runway an the TKOF Objects Specific. An airport terminal is located at the airport with ablution facilities. A free telephone service is available at the airport, however calls are restricted to local calls to Kalbarri. The fee to land at the Kalbarri Airport is $15.50. This can be paid at the airport or Shire office in Kalbarri at the Allen Centre on Grey Street. Private aircraft can be parked permanently at the airport. There is a fee of $264.00 per annum and is payable in lieu of any landing fee. Click here to view the Disability Acess Facilitation Plan for the Kalbarri Aerodrome.